Carbon Fiber or Aluminum Tripod? 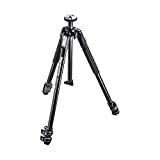 There are two travel tripods that we can choose from. There’s the lighter one, that weighs around 3.7 pounds, which is the carbon fiber version, and the slightly heavier one that weighs around 4.6 pounds, which is the aluminium version. Despite the weight, carbon fiber version is more expensive. You might ask about the quality. Well, you have yet to figure that out. Aside from the difference in weight and price, there are a few more pros which you can learn about below. This might help you decide which version is best for you. It is not because of the advantage of being a light that the carbon fiber version is a bit more expensive. It is about production cost. Apparently, carbon fiber is an exotic material. The aluminium version is sturdier than carbon fiber, so it ensures you that your tripod will stand firmly on the ground. Vibration transmission could mean a great difference and becomes a problem, especially when taking longer exposures or videos. Aluminium is a metal. And like most metals, if it is not cleaned properly, it is more likely to rust sooner than expected. But if you take necessary cleaning measures, then you can still be able to enjoy your aluminium legged tripod a lot longer. This is one of the most obvious differences between the two. The aluminium version weighs less than a pound heavier than the carbon-fiber version. This difference in weight might let you think that it’s not really a big deal. However, if you are the outdoor type and are probably obsessed with good, quality photos, then you might think twice about it. When travelling, you probably want to carry less weight as much as possible. It lets you enjoy more, saving you enough energy for you to use in your adventure. ZOMEi Z669C Portable Carbon Tripod Monopod is one of the best lightweight tripod. Nowadays, anyone can take good pictures. Camera technology has taken its way up to a new level that with a single click, touch or wave, any picture could become more priceless. And no, we don’t mean using backlighting and other techniques, it really is just about the camera. Taking good pictures or videos is not just about having a Good camera Tripod and the perfect angle of perspective. You also need a nice steady pair of hands. One thing that could help you out with achieving your goal is a tripod. Some people think that tripods are just plain accessories, but you’ll be surprised how much better a photo or a video could turn out when using a tripod. One obvious reason for using a tripod is to provide stability to the camera. This will prevent the camera from shaking, especially when long time exposures are necessary. Usually, there are only a few people who can hold a camera steady below 1/60 of a second shutter speed. Travel tripods are conveniently portable and can bring your camera well off the ground. 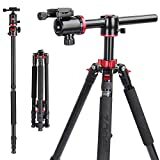 These types of tripods are perfect for any outdoor activity like strolling through nature parks, biking, and even hiking. This kind tripod is capable of supporting digital SLR with a kit lens, or a modest zoom lens. You can also try a compact Video Camera Tripod on it. But you’ll have to be careful if you’re using a hefty table or a long zoom lens when its front is heavy, or your camera set-up will flip over. 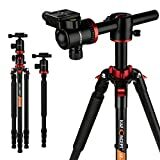 This lightweight tripod allows you to take good pictures steadily, as well as allows you to capture outdoor activities with no hassle. This perfect combination of good stability and lightness is all thanks to the carbon-fiber legs. But you have to make sure that the camera’s not too heavy for the tripod. "I received this well built, travel tripod today and thoroughly tested it for ease of use, functionality, and quality. I am positively impressed (and doubly so for the price)."